Francis Ford Coppola’s timeless classic comes to Blu-ray for the first time! 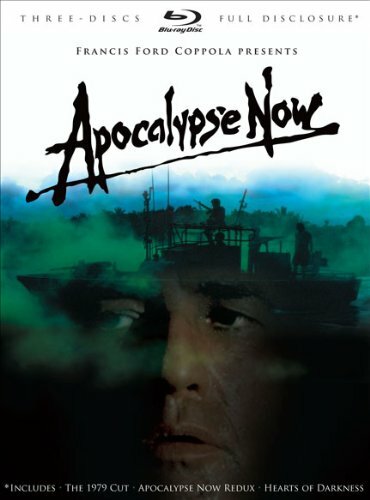 This 3-Disc Deluxe Edition includes Apocalypse Now and Apocalypse Now Redux in stunning new transfers supervised by Francis Ford Coppola – and presented for the first time in their original 2.35:1 theatrical aspect ratios. Also included is the feature-length making-of documentary Hearts of Darkness, presented in a new 1080p HD transfer. Additional features include a 48-page collectible booklet with never-before-seen archives from the set, over 9 hours of bonus features, plus a storyboard gallery, image galleries, marketing archives and an original script excerpt from John Milius featuring hand-written notes from Coppola. •	Apocalypse Now – The 1979 Cut and Apocalypse Now Redux are presented for the first time in Hi-Def! •	New 1080p transfers supervised by Francis Ford Coppola – first time ever in original theatrical aspect ratio (2.35:1) in home entertainment release! •	Exclusive to Full Disclosure edition: 48-page printed collectible booklet with letter from Francis Ford Coppola, never-before-seen archives from the set, behind-the-scenes photos and more! Geek Deal of the Day!!! The ‘Lethal Weapon’ Blu-ray Collection! 54% Off!!! Geek Deal of the Day! ‘Indiana Jones’ Complete Movie Set! 60% Off! Only $39.99!! Cheapest Ever! Geek Deal of the Day! ‘Breaking Bad’ Seasons 1-4 Blu-rays are $11.99 Each! Cheapest Ever! This entry was posted on Monday, September 26th, 2011 at 11:51 pm	and is filed under News. You can follow any responses to this entry through the RSS 2.0 feed. You can skip to the end and leave a response. Pinging is currently not allowed. « Geek Deal of the Day!!! Harry Potter 1-7 part 1 Blu-Ray & DVD Movie Set!!! 63% Off!! !